Oooookay. 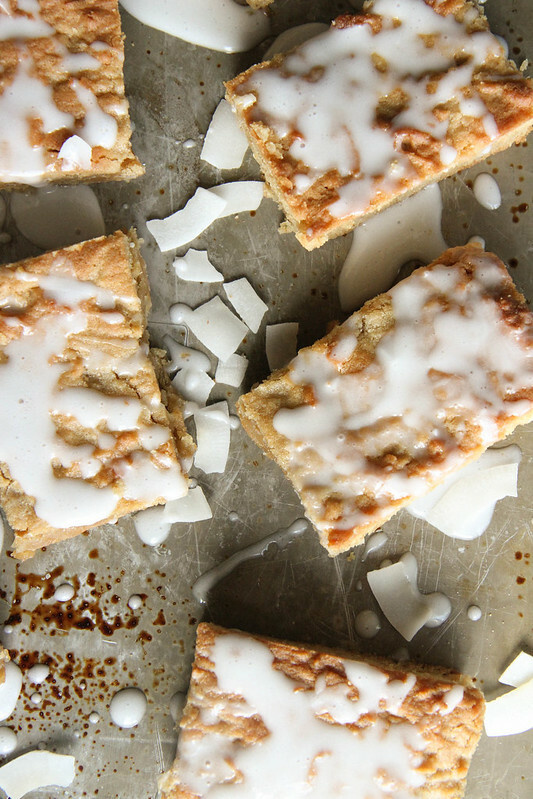 We have taken three of my favorite things here: coconut, coffee and blondies and jammed them all together in this ridiculous bar that is so worth devouring. The sweetened coconut and brown sugar is nicely tempered in these by the strong bitter espresso. Plus I love that these turned out chewy and moist not dry and cakey (which grosses me out in a blondie). I am very particular about my blondie texture! Preheat the oven to 350 degrees and prepare a 9×13 jelly roll pan with cooking spray and parchment. In the bowl of a standing mixer, cream the butter and sugar until fluffy. Add the eggs and the espresso and mix until creamy and well combined. In a separate bowl, combine the dry ingredients and add to the batter. Add the coconut and mix until everything is well combined. Bake for 20-25 minutes until they are cooked through in the middle. Let them cool completely before slicing. 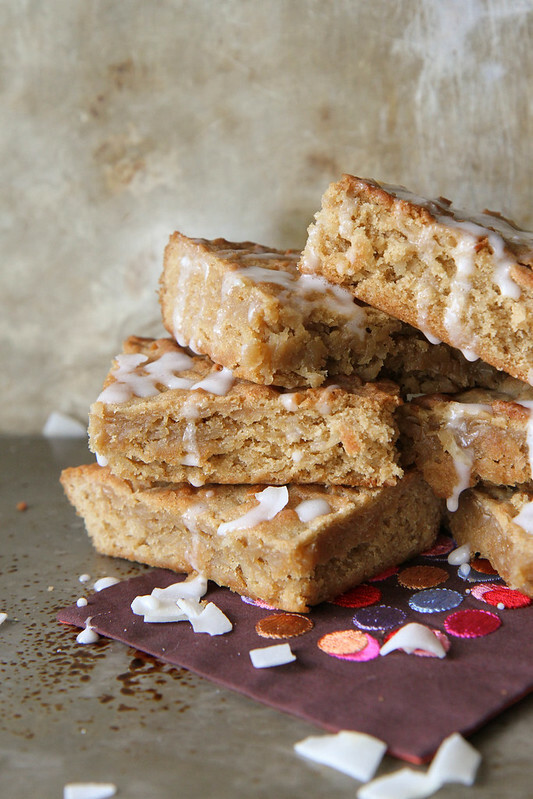 While the blondies are cooling, make the drizzle by whisking the cream, sugar and salt together in a small bowl and set aside until the blondies are cool. 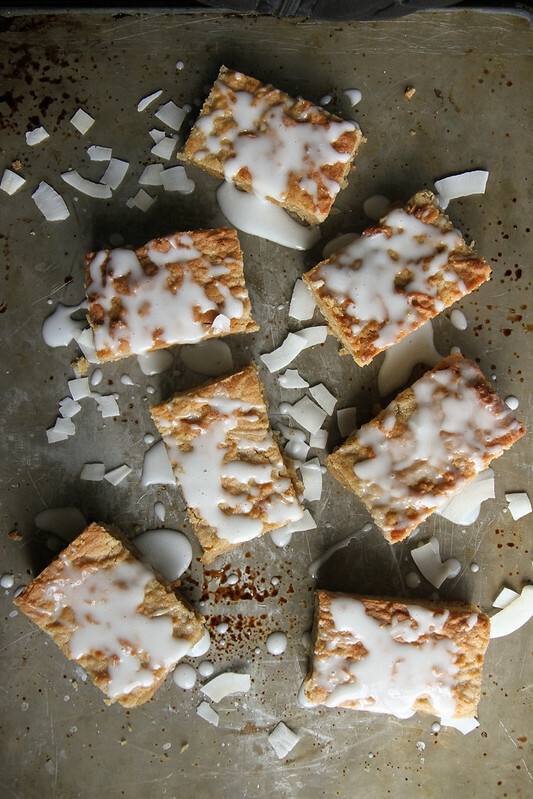 Drizzle the blondies with the cream and serve. Ugh, I need these in my life. Stat! Coconut + coffee?! Sign me up! You hit a grand slam with these! And frankly, I have NO idea how you keep up with all the things that you manage to do. I was wondering what the heck your secret was the other day when I was washing dishes! Bring on the carbs! And coconut! And coffee! Oh, these are on the agenda for Saturday. Could you please clarify whether the espresso is in liquid form or the instant espresso powder, undiluted? …I knew what you meant :). I love a chewy blondie too!! Num!! Coffee and coconut?! Best combo ever!! These. look. fabulous! I can almost taste the flavors and that texture – perfection! Love everything you make. Your food photography skillz are phenomenal. Omg- thank you so, so much Akansha! These are right up my alley! Can’t wait to try! Want these for breakfast, lunch and dinner please. making them to bring to my tennis match tomorrow. Hope we win. Oh my – these sounds utterly amazing! I must find a reason to make them soon!! These are magnificent! Thank you for the awesome recipe! Hi there. You mention shredded coconut. Is it the dry dessicated one or fresh coconut? Dry coconut Nikki, and then you batter the prawns.